UNCASVILLE, CONN. – June 15, 2018 – Barrett-Jackson, The World’s Greatest Collector Car Auctions®, is set to bring various models of 2017 and 2018 Chevrolet Corvettes from the General Motors Collection to the auction block at the 3rd Annual Northeast Auction, June 20-23, 2018, at Mohegan Sun in Connecticut. Highlighting the group of six Corvettes that will be offered with No Reserve is a 2018 Z06 (Lot 718) and 2018 Grand Sport Carbon 65 Edition Convertible (Lot 718.1). All cars have been used extensively by Chevrolet at special events and car shows, and included with the sale of all six Corvettes is a two-day owner’s school at Spring Mountain Motor Resort. The 2018 ZO6 coupe (Lot 718) is powered by a supercharged 6.2-liter V8 LT4 engine backed by a 7-speed manual transmission. 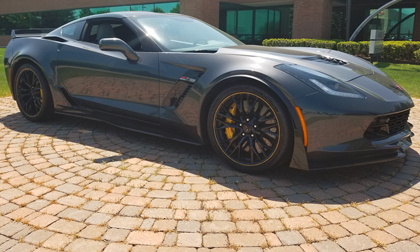 It comes equipped with the Z07 Ultimate Performance Package, which includes Brembo ceramic brakes, PS Cup tires and Z07 suspension, and has just under 800 miles. The 2018 Corvette Grand Sport Carbon 65 Edition Convertible (Lot 718.1), finished with a Ceramic Matrix Gray Metallic exterior and Jet Black interior, features a 6.2-liter V8 LT1 engine backed by an 8-speed paddle-shifted automatic transmission. Following the Z06 and Carbon 65 Edition is a pair of Corvette Grand Sport Coupes. Lot #719 is a 2017 coupe powered by a 6.2-liter V8 LT1 engine backed by a 7-speed manual transmission and comes equipped with the Z07 Ultimate Performance package. A 2018 Grand Sport Coupe (Lot #719.1) has a 6.2-liter V8 LT1 engine with an 8-speed paddle-shifted automatic transmission. The Arctic White exterior features include yellow fender hash marks, custom yellow calipers, Grand Sport black aluminum wheels and Grand Sport Heritage center carbon-flash stripe. The group of six Corvettes is rounded out with a pair of 2018 Stingrays. Lot #720 is a convertible finished in Corvette Racing Yellow with a Jet Black interior and was the sixth unit built in 2018. It features a 6.2-liter V8 LT1 engine backed by a 7-speed manual transmission. A 2018 Stingray coupe (Lot #720.1) was the very first reproduction built for 2018 and is finished with a Torch Red exterior and Jet Black interior. It is powered by a 6.2-liter V8 LT1 engine backed by an 8-speed paddle-shifted automatic transmission and comes equipped with multi-mode performance exhaust and remote start.